Feng Shui mirrors are vital parts of the entire Feng Shui culture. In fact, they are so serious that they are considered “the aspirin of Feng Shui.” They received this name because of their supposed ability to cure problems of an area or room, whatever those problems may be. Additionally, mirrors are also part of the Nine Essential Chi Adjustments of Feng Shui. Overall, mirrors are pretty positive things to have in a certain space. However, there are also some major no no’s when it comes to Feng Shui and mirrors. For example, having a Feng Shui bedroom mirror is a huge mistake and can cause some major issues. Convex mirrors, on the other hand, are used to fight off negativity by reflecting it off the mirror and towards an exit of your house, such as a door or a window. Regardless, whether you have a bedroom mirror, convex mirror, concave mirror, or an entryway mirror, here are a few tips, dos and don’ts to guarantee that your mirror is Feng Shui friendly. First, let’s discuss Feng Shui and how it affects your average bedroom mirror. Having a mirror in your bedroom is a huge “don’t” in Feng Shui culture. The reason for this is because mirrors in a bedroom capture all of the light shining in from outside sources, therefore preventing you from getting a good night full of restful sleep. Additionally, a mirror is said to disturb or even stir up the atmosphere and environment in a bedroom. Furthermore, perhaps also going hand in hand with the argument that mirrors prevent you from getting good sleep, bedroom mirrors cause bad Feng Shui because they take away from the sanctuary feeling of your room, which is said to also be bad for your health. However, mirrors are especially bad if they are placed above your bed’s headboard, as it is said to resemble a window. Windows above the bed are also bad Feng Shui, because it has the capability to allow an escape for your Chi energy while you are sleeping. But luckily, even if you can’t move your mirror out of your room, you can still have hope for good Feng Shui. Simply cover up your mirror with a towel, cloth, blanket, sheet or the like, making sure that none of the glass can reflect anything whatsoever in your bedroom. While it is suggested to move a mirror with bad Feng Shui (such as a bedroom mirror) into a place such as the living room, dining room, or a hallway, one hall you have to be extremely cautious when messing with is the entryway. Typically, you don’t want your mirror to be 5 feet or closer away from you as you walk through the door, stepping into your house. The reason for this causing bad Feng Shui is that it causes your Chi energy to bounce off the mirror and escape through the door if the mirror is anywhere 5 feet or closer to it. So if you have a mirror in the entryway of your home, make sure that it is far from 5 feet away from the very first step you take inside. 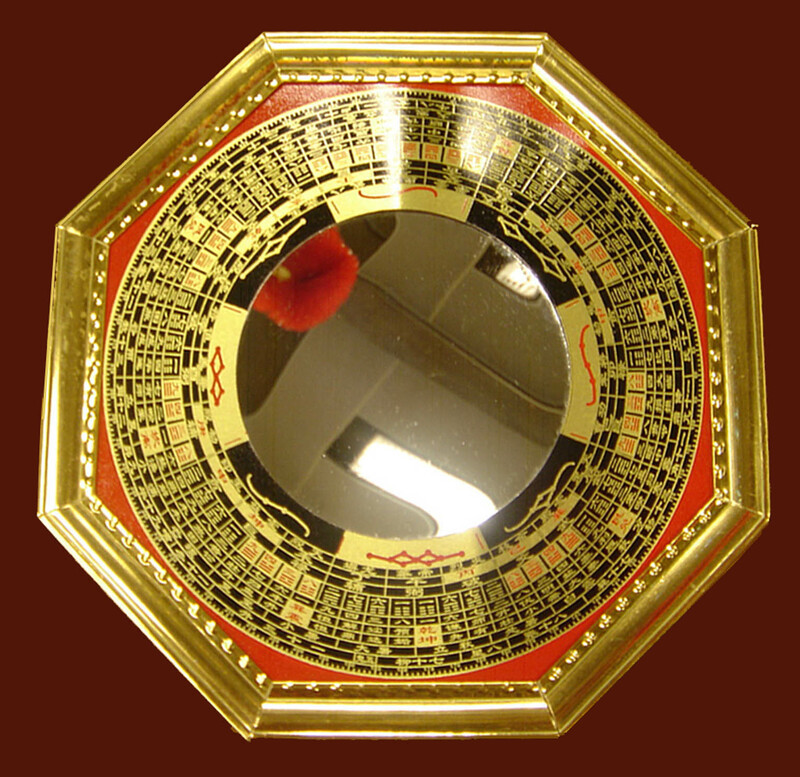 A convex mirror is also considered a bagua mirror, along with concave mirrors and basic bagua mirrors. A convex mirror has the shape of an octagon, and any bagua mirror is used primarily to fight off negative energy in a house or specific area. With a convex mirror, you can fight off negative energy that is being directed towards your home. The energy bounces off the reflection of the glass, and as long as you have the mirror facing some sort of exit (such as a window or door), the negative energy will leave. However, even though this is a relatively good cause, the use of a convex mirror isn’t desirable by many. Mainly because the use of a convex mirror is considered aggressive, people don’t want the constant bouncing off of negative energy going on in the midst of their homes. It also requires much caution when positioning. For example, if the negative energy is being caused by a neighbor, if you face the mirror to where the negative energy will bounce off and direct back to the source of the neighbor, this will just increase the amount of negative energy in your home and your life due to the unforgiving and revengeful spirit inside of you. Feng Shui mirrors can either cure a cause or plague a cause. Your use of mirrors in a home must be dealt with major care, and ignorance is not an option. Your mirrors can either cause negative energy or cure it, replacing it with rather positive energy. However, that all is determined simply by the positioning, the location, and the shape of mirror.